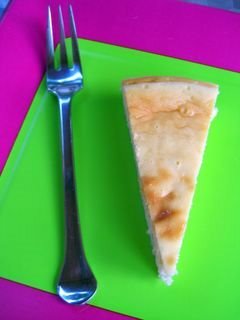 What do you do when you already have a really good cheesecake recipe, but want to make another one? Sometimes, it is hard to justify trying a new recipe when the one you have is excellent because it is taking a risk on something new when you already have a sure thing going. The best solution is to make a variation on the recipe, which will give you a similar product, but get you there in a new and different way. For example, I wanted to make a cheesecake, but I didn’t want to use the same recipe again (even though it is fantastic). I made ricotta cheesecake instead. Ricotta cheesecake is rich, but light at the same time due to the ever-so-slight texture that the cheese gives the cake. Of course, it’s not “light” in the sense that it is low in fat or calories, but you’ll certainly never mistake it for the super smooth and super dense New York-style cake. This cake has a hint of lemon, which is tasty and almost refreshing in the chilled cake. I prefer it this way, but I won’t say that it’s necessarily better. I used the recipe from Joy of Baking because it incorporated both cream cheese and ricotta, giving the cake a good flavor profile. The cheesecake whips together in minutes and, though it does bake in a waterbath, it is easy to tell when it is done because you want it to brown slightly on the top. As it bakes, the cake will puff up a lot, almost twice the size that it will be after it cools. After it deflates, there will be small wrinkles around the outer edge of the cake, giving it a distinctive and appealing look. I omitted a crust because I noticed that many ricotta cheesecake recipes leave it out. While I crust would have been fine, I do think that the texture of the cheesecake was subtle and might have been lost with on the tongue with the crisp, crumbliness of a crust. It still would have tasted good, though. One final word of advice: don’t eat cheesecake at the end of a meal. You won’t be able to finish a piece, but you will want to and will probably just end up feeling guilty that you wasted it. And even if you stuff yourself, you won’t feel good enough to actually enjoy the flavor. Instead, have a piece with your coffee in the afternoon, when you’re really able to savor it. Preheat oven to 350F. Butter and flour a 9-inch round springform pan. Wrap the bottom in two layers of aluminum foil. Place a deep pan, large enough to fit the springform pan, in the oven as it preheats and fill it with about one inch of water. In the bowl of a food processor, combine ricotta and cream cheese and process until smooth. Add in sugar, whizzing for 2-3 minutes so the sugar dissolves in the cheeses, then add cornstarch. Add in the eggs one at a time, waiting until each is fully incorporated before adding the next one. Add lemon zest and vanilla and pulse until blended. Pour mixture into prepared pan. Place pan into waterbath that has been heating in the oven. Bake for 65-75 minutes, until the top is lightly browned, but the center still jiggles slightly when the pan is gently shaken. Remove from waterbath and cool on a wire rack. Chill overnight in the refrigerator before serving. Cake will keep several days, covered, in the fridge. Mmm. A friend of mine recntly made one of these, but with some kind of aniseed (liqueur?) in it. Yum! Mmm, I love ricotta cheesecakes. 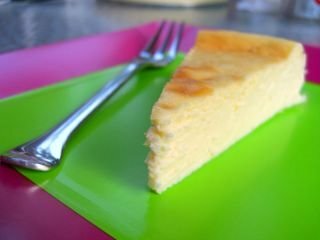 My favorite cheesecake recipe uses both cream cheese and ricotta. It gives it a great texture. Looks wonderful. Though now I want to make your original marbled cheesecake. Did you ever try the bullseye? Hi Nic, hope you don’t mind if I give a link to my bulls-eye cheesecake. Also, was this ricotta cheesecake similar in texture and flavor to a Japanese cheesecake? Thanks for the additional link, Lori. I haven’t tried the bullseye yet. I’m sticking with the marbled effect for now! And I’ve never had a japanese cheesecake, so I can’t personally compare, but I believe that this would be a bit heavier from the descriptions I’ve heard. Will be trying out the bullseye really soon! Looks incredible lori! Great work! Hey again Nic, I finally tried the bullseye. It’s adorable! Not as complicated as it looks! I made little cupcake forms though….I love cupcakes and theyre much easier to serve and give away. delicious! made it for my friends on tuesday, and it was a big hit! i used a 9″ round cake pan and only refrigerated for an hour. next time i’ll use my springform as it’s a little taller and the cheesecake overflowed a bit before deflating.